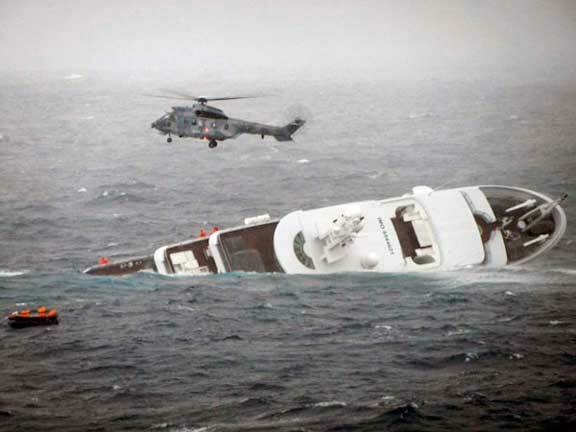 Last year the new super yacht, Yogi, lost power while on passage, turned beam to the seas, capsized in moderate conditions, and eventually sank. There was all sorts of speculation at the time about causes. Now the official report is out. It makes interesting reading both for what it does and doesn’t say. 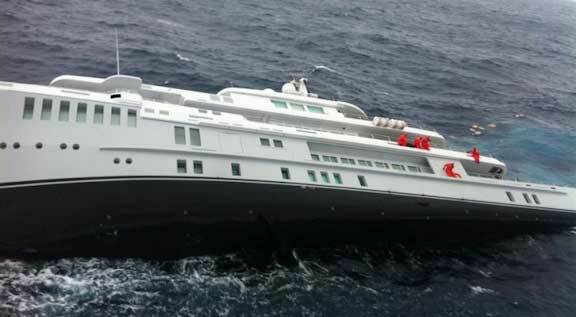 On the 16 February 2012 night the French motor yacht YOGI bound to Cannes was underway in the Aegean Sea with an eight member vessel operation crew. Weather conditions were relatively good (following sea and wind) and both engines were running; the average speed made good was close to 14 knots (cf. 7.6). An abnormal cooling freshwater temperature rise and a leak on the starboard engine exhaust, obligated the master who was on watch to stop this engine. Soon after, as the port engine was overheating, it shut down automatically while the chief engineer, on watch, was asking the master to reduce the motor speed. The master informed the designated person ashore. The vessel was then drifting, broadside on to the waves, and listing to port. The strainers of both engine sea water cooling circuits had been checked but found clean. The port engine had been restarted and the temperatures were back to normal; the master decided to head to Skyros Island, 25 miles away, but the helm was out of order and a rudder angle of 30° to starboard was displayed. A MAYDAY with a ship evacuation call had been transmitted. 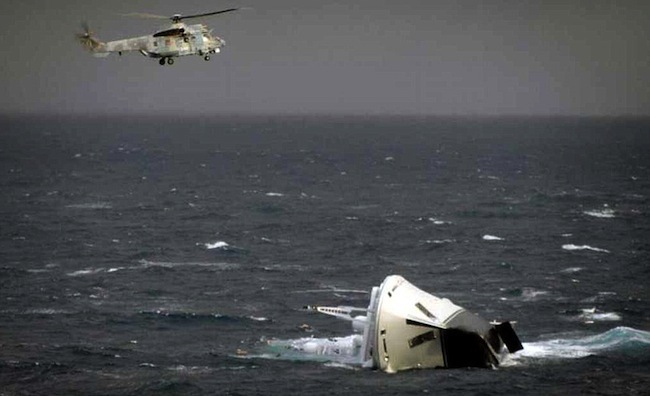 A salvage tug had been made ready and the intervention of a Greek Coast Guard helicopter had been rapidly confirmed. At 8.50 am, the winching operations were completed and the crew was safe and sound. At the end of the morning,YOGI sank to the bottom at a depth of 500 meters. Maximum speed : 16,4 knots (Beaufort 2/3). Master‟s report: wind NNW 5 to 6 with 35 knot gusts. Swell 2 m to 2.50 m high. Météo France most probable analysis: from the end of Dardanelles straits to PAN PAN position, wind NE 10 to 15 knots then NNE 25 knots (30 to 35 knot gusts). Significant wave height between 0.70 m to 1 m, sea state slight, then moderate in the western and south-western part of the basin, reaching 1.30 m to 1.50 m after 8.00 pm around Skyros. The mixed wave height mainly due to the wind action remained moderate. The most probable maximum height measured in a hundred wave sample (about 1 wave every 10 minutes): 1.50 m before 8.00 pm reaching 3.00 m after 11.00 pm around Skyros. Considering a thousand wave sample (about 1 wave every 1.5 hour), the values would be increased of 0.4 m to 0.70 m.
In order to keep off a broadside on to the waves route, the engine was kept running dead slow despite the unavailable helm. Soon after, the first officer and the master mechanics carried on a second investigation in beach club 1, after they had put on their survival suit on the bridge; it appeared to them that the height of water was the same than previously. Due to the tacking, the list shifted to starboard and increased suddenly. Water from the sewage tank flooded the engine room. The report goes on to discuss the crew’s having reported a lack of ability and a denied request for a new inclining test to determine the correct vertical center of gravity. There are also compartmentalization issues. Owners, designers, and builders alike can profit from a close read of this report. This entry was posted on Friday, May 24th, 2013 at 2:15 am and is filed under Dashew Logs, four. Both comments and pings are currently closed. Sounds like an insurance job to me. Anything is possible, but they picked a funny way to do it if this was the case. I’d say the odds favor a combination of harmonic rolling and lack of stability with some event in the engine room that reduced their ability to steer. What the report does not address is the limited stability that is considered adequate. The standard for MCA and most other rating agencies allows stability to peak by 25 degrees and vanish around 45-50 degrees. This is OK as long as you don’t end up beam to the seas, or subject to harmonic rolling where even small waves can get you past the point of recovery. May the writer gently suggest that anyone who goes to sea on any vessel know its stability characteristics, and how these vary with payload. Not sure what that is. Perhaps someone amongst the SetSail group can shed some light on this. I doubt it is stabilizer fins. The photo perspective has caused some foreshortening. They are stabilizer fins that are about amidships and can be seen in the photos of the vessel taken from the beam.